gender) in event #11 of the 2018-19 Runners Shop Twilight Series at Mount Majura West on Wednesday. All competitors enjoyed the slightly cooler weather and the courses prepared by planner James Heyes. 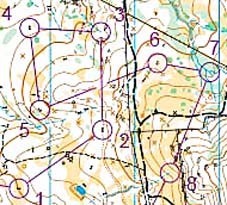 His courses were well-designed with excellent changes in direction for the Orange courses, in particular his use of the boxed square, mid-course, (see the image from the Orange 2). And he paid particular to ensuring that the Orange 2 was not too physically demanding for older competitors in terms of climb and accessing control sites. Other course planners should follow his example. Apart from Martin Dent strengthening his hold on the top position through improving the total of his best six scores by four points, there was no change in the scores of the others in the top five. The results are here, the Winsplits are here, the standings are here and photos from the event are here and here.